Thank you so much for joining our Mustela Giveaway. Again, I enjoyed reading all your entries. I wasn’t surprised that a lot of you do swear by the product as this is really the best one among all the skin care products for babies in the market today. I am happy to note also that some of you express interest in trying this on your babies. I guarantee you, you wouldn’t regret it. My daughter and I have been using Mustela products for a good 10 years now, from dryness to rashes, from itch to burn, they never fail us . And now for the moment all of us have been waiting for, the announcement of the winner. As much as I would want many winners, we can only have one, and the lucky girl is none other Jenny C. Diano! 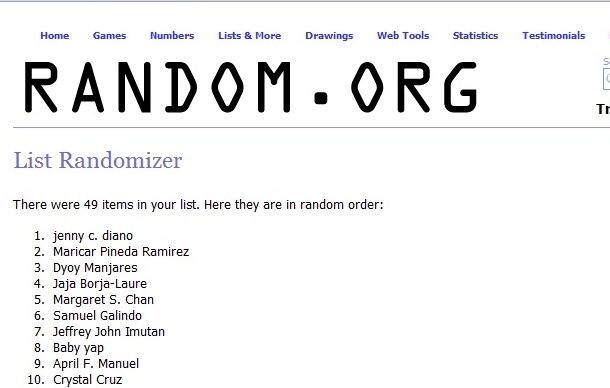 Congratulations Jenny, please wait for my email with instruction on when and how you can pick up prize.